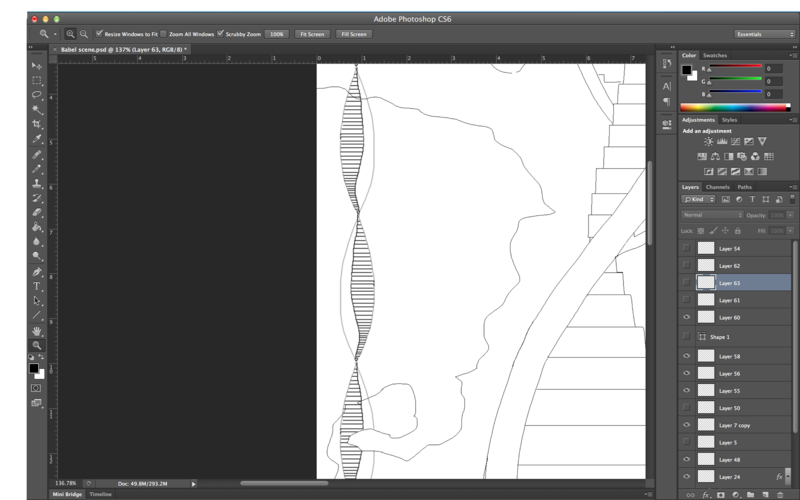 The basic outline of the stairs, I wanted something large in the foreground and so the image has depth when I add the smaller detail in later. 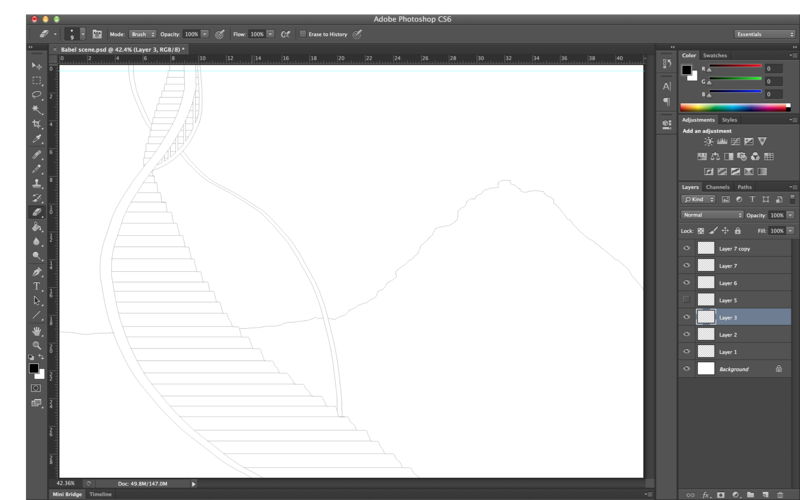 I have now smoothed out the wobbly lines on the stairs and added banisters to the steps. I have to put in the details in now because when it comes in adding the material it’s easier to selected and deleted areas of texture. 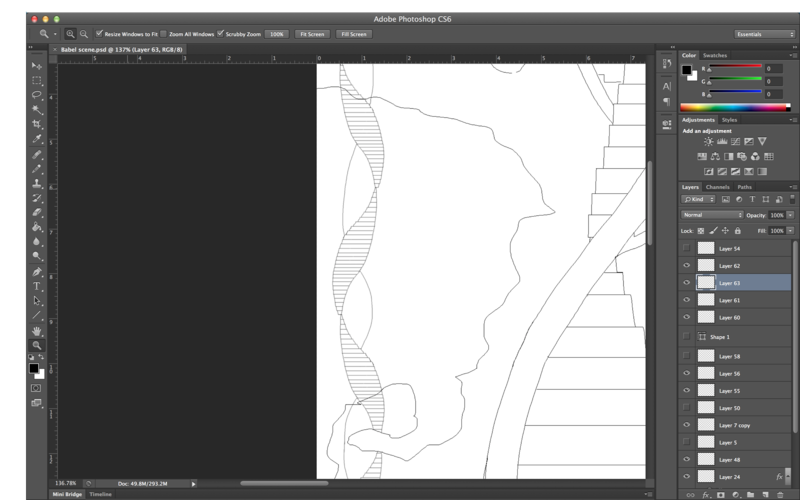 I think it looks a lot better and not so clumsy, it also matches the main stairs. So I added these to the scene but changing the size of it depending how far they have been placed in the distance. 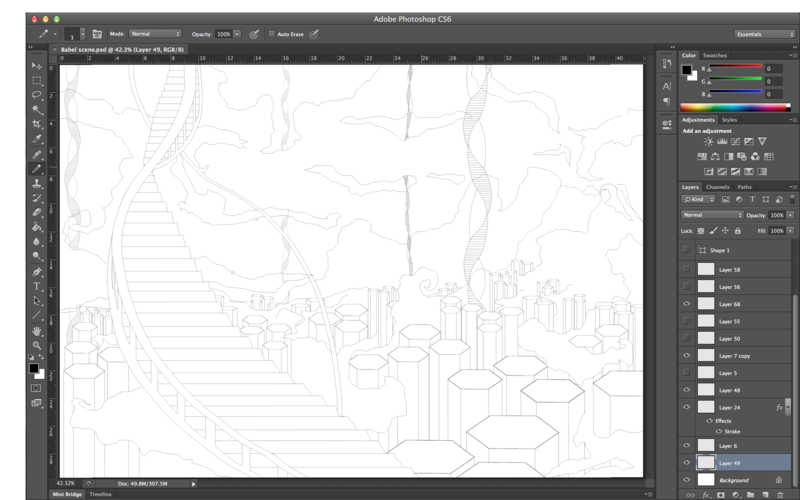 I have used a grey colour for the hexagons as I think they would be solid structures that would dominate the land. The sky looks quite thick with lighter areas of cloud and the volcano is pouring out the smoke too twisting and winding through the valley. I added the volcano as I thought the land would need some essence of nature and volcano are strong and hard to destroy so I left t in the landscape. The diamond thing in the middle is a Photoshop tool to rotate the image and it was stuck on my screen but thats not part of the image. 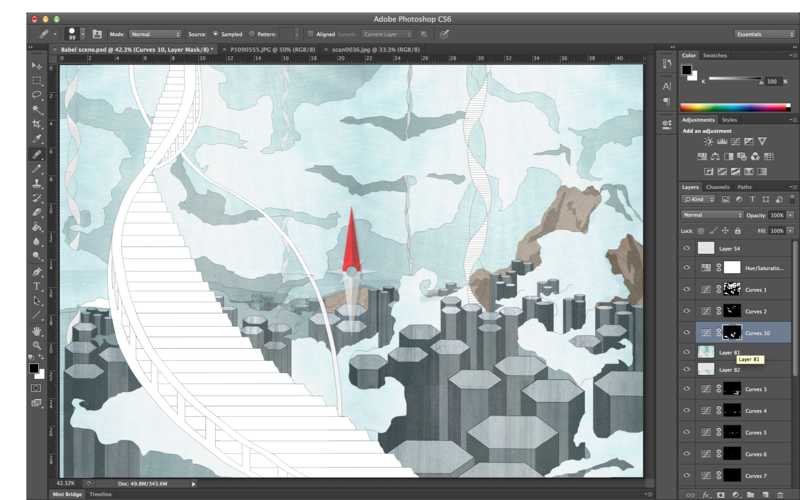 The final scene with colour, from previous work tutors have told me bring out a dominant colour and in this scene it would be the red stairs that tower over the land. 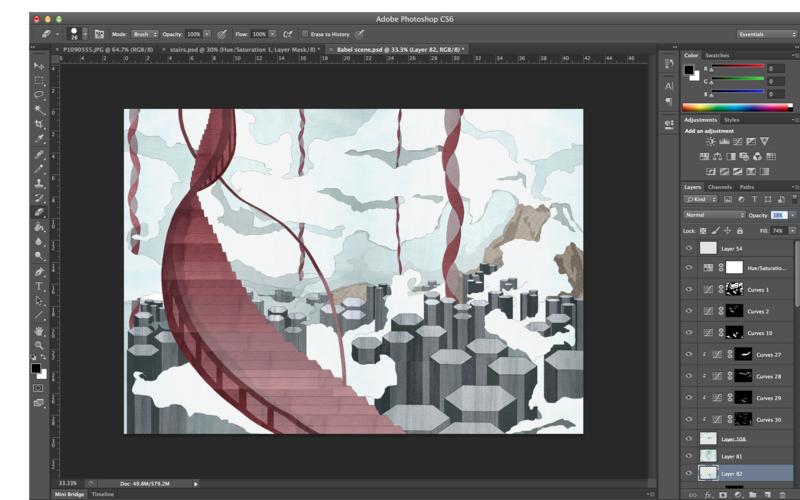 Adding shadow the clouds and darkness to the hexagons exaggerates the depth and expanse of the land. 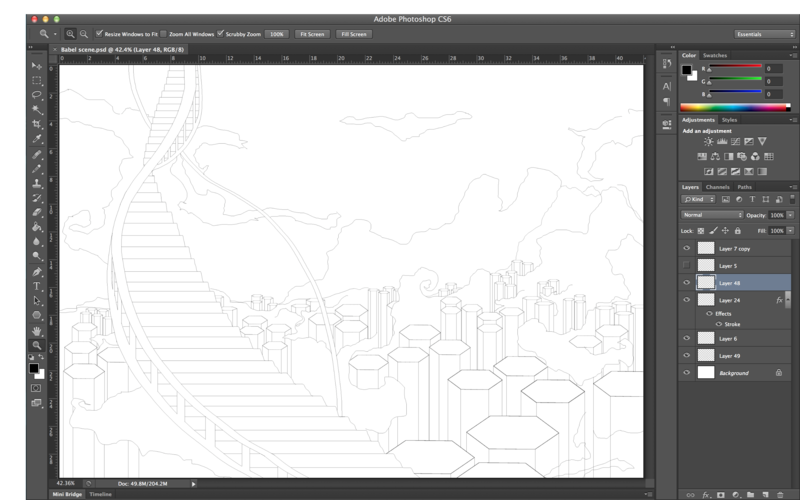 I think this image shows that this isn’t a normal landscape like we would see of a city, it is an alien land that has a repetition of hexagon and stairs. Overall I like the image and sense of mystery to the land but to make it stronger I would maybe add a character or figures to put life into the image. This scene would be the start of a sequence that would take the viewer into and through the land exploring what it’s all about. This entry was posted in Development of a piece of work.